The remote land of the Yukon offers the same dramatic sceneries that the Canadian Rockies and Alaska have in spades - massive snow-covered mountains inhabited by wolves and bears, and emerald lakes flanked by pine forest - but the Yukon's absence of real tourism gives it a sense of isolation like no other. This trip couples outstanding natural beauty and wildlife with fascinating goldrush history. Our trip begins today in Whitehorse. On arrival we have time to relax or explore the town. The discovery of gold in the Klondike (a tributary of the Yukon River) in 1896 changed the course of history for Whitehorse, now the capital of the Yukon territory. Previously inhabited by First Nations people, the area around the Yukon River's treacherous White Horse rapids was settled by crowds of prospectors, all hoping to make their fortunes through prospecting for gold. The area became known colloquially as Whitehorse, and although the river was dammed in the 1950s and the rapids were submerged, the name has stuck. Today we immerse ourselves in Gold Rush history as we visit the MacBride Museum and its collection of artefacts and pictures, depicting life as it was at the turn of the century, along with profiles of the town's colourful characters, many of whom made or lost their fortunes in Whitehorse. We also discover the SS Klondike, a magnificently restored sternwheeler boat that represents a time when riverboats and rail were the Yukon's only links to the outside world. After spending time amid the old restored buildings and the Gold Rush sites, we head to Miles Canyon, just a short way from the city. Walking across the suspension bridge we will see the emerald river carving its way through the mountains; before a dam was erected, this river would be peppered with rapids, through which daring stampeders would make their way as they travelled to Whitehorse. This morning we drive to Carcross, home to the Carcross Desert. We spend a short time walking across the sand dunes that make up this tiny area, and take in the views of the surrounding mountains - it's bizarre to think that during winter the sand is covered over by snow, and the area is used for cross-country skiing and snowboarding. We then head to the railway depot to board our train across the mountains to Skagway in Alaska. The railroad was built in 1898 to connect Skagway with Carcross to ease the passage of the stampeders - prior to this, the trail was attempted on foot, earning the nickname 'The Dead Horse Trail' for the estimated 3,000 horses that died in just 2 years. Today we can appreciate the spectacular panoramas of mountains, glaciers, gorges and waterfalls from the comfort of our vintage train carriages, as we wind up through the Yukon mountain range. We break our journey at Bennett to stretch our legs and admire the mountainous scenery around this lakeside village. This remote outpost is accessible only by this train or a 50km hike, and after a short visit we continue on the train to summit the White Pass and descend into Skagway. The itinerary for the next two days depends on the ferry schedule, which is usually released in spring. If the ferry is in the morning, we jump on board and take our 45 min journey towards Haines through the Taiya inlet, flanked by mountains on either side. On arrival we have the privilege of visiting a Tlingit indigenous village, home to the Tlingit community who were the first settlers in the area around the Chilkat Valley many hundreds of years ago. Their traditions still flourish today in the songs, dances, languages and stories passed on from generation to generation, and we will learn a little about their lives during our visit. We have the afternoon free for optional activities, including a rafting excursion (not white water) on the Chilkat River, through the Chilkat Bald Eagle Preserve and either a kayaking excursion or nature and bear watching on the Chilkoot Lake. All activities will be in locations where bears, wolves, moose and eagles are frequently spotted, surrounded by towering mountains, hanging glaciers and lush forests. If the ferry is in the afternoon, we will do a morning hike in the Klondike Gold Rush National Historical park before our departure for Haines. We will visit the Tlingit community in the afternoon and catch up on the optional activities tomorrow. Depending on the ferry schedule yesterday, we may catch up on any missed optional activities this morning before heading off on our four hour drive to Haines Junction, crossing back into Canada en route. On the way, we visit the Chilkat Bald Eagle Preserve, a state park and wildlife refuge home to the world's largest concentration of bald eagles, where we may see these majestic birds in the flesh. The Haines Highway is noted for the grand views of the Kluane mountain range with its magnificent glaciers, and the variety of scenery from coastal forest near Haines to alpine tundra at the highest point, before descending to Haines Junction. During the drive we will stretch our legs on some of the trails, one of which is an easy 45min walk to Kathleen Lake, a beautiful blue lake at the base of the mountains, surrounded by alpine forest. Arriving at the cabins south of Haines Junction in the late afternoon, we spend the next two nights in a simple cabin in the wilderness of Kluane National Park, with shared shower facilities. Kluane National Park is dominated by North America's highest mountain range, the Saint-Elias range. There are many hiking trails here of varying difficulties, lasting between 2-5 hours, and our Explore Leader will take us on a trail that suits our abilities. Whichever trail we do, we will have the feeling of being truly in the wilderness, surrounded by spectacular mountains and hiking through forest up to barren tundra. In the afternoon we are free to enjoy this paradise. There is the opportunity to take a scenic flight over the national park, flying over the most spectacular sections of the mighty Kaskawulsh and South Arm Glaciers, with the mountains of the Kluane Range spreading endlessly before us. We cross the border once again into Alaska during our scenic drive to Tok. During this 6 hour journey we explore one of the ghost towns that sprang up as gold was found in the Kluane Lake area. These villages were transient and the boom of gold prospecting died out as quickly as it began, leaving these smaller settlements to go to ruin. Ruins and graves are now scattered through the forest, and we take the opportunity to visit the ghostly 'Silver City', somewhat ironically named but bearing no relation to any other precious metals found in the area! We have plenty of other opportunities to stretch our legs during the drive as we walk amid the outstanding panoramas of the Kluane range, exploring the rivers and forests that lie beyond trails just off the road. Today's night stop is a typical motel just outside of Tok. Heading out of Tok, our first stop is at Chicken Village, a living museum of Gold Rush and Alaskan frontier history that has a year-round population of only a few dozen inhabitants. We join a daily tour of the town (this visit may include people who are not travelling with our Explore group), which is less of a tour and more of a viewing of the small handful of buildings that make up the settlement. The old wooden houses are fascinating, and we visit the school house, which was home to 'Tisha', the name given to Chicken's most famous inhabitant, the teacher Anne Hobbs Purdy. Anne later co-wrote a book recounting the difficulties of living in this close-set community, where there were many prejudices against the indigenous children whom she was dedicated to educating. Leaving Chicken Village we take a scenic woodland walk to a viewpoint over the Cowden Dredge, a dilapidated Gold Rush dredge on the Mosquito Fork River, abandoned in its wild location in the 1930s. 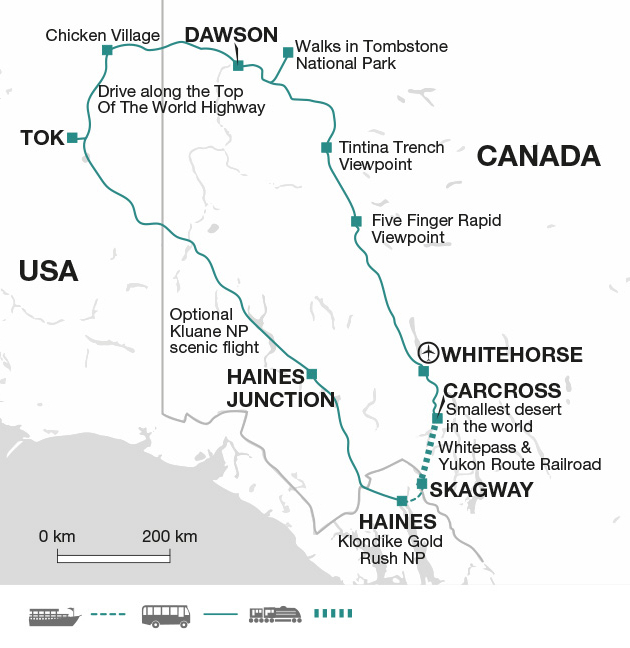 We then continue on our adventure and join the 'Top of the World Highway' towards Dawson, Canada. Meandering over the ridges far above the treeline, the endless views over the rough, lonely landscape are quite spectacular, with rolling hills and barren shrub, perforated by alpine trees. Towards the end of August, the land turns brightly autumnal with a blanket of almost unreal reds, yellows and oranges spreading before us. The road is rough in places and weather can be erratic, but the adventure and feeling of being alone in the wilderness is incredibly memorable. We return to civilisation in the early evening, as we arrive into Dawson city. Exploring Dawson on foot, we visit some of the beautifully restored wooden buildings and bustling streets that once gave this city the nickname 'Paris of the North', harking back to a time when it was one of the most wealthy and influential cities in North America. Dawson is an intrinsic part of Gold Rush history, and with the facades and shopfronts of the era still intact, walking around the city seems somehow like stepping back in time. A quirk to our discovery of this historic city is our exploration of the 'Paddlewheel Graveyard' on the banks of the Yukon river, home to the remains of around seven historic paddlewheel boats, abandoned here as land travel became more popular and now heavily overgrown with woodland. The wrecks look almost as if they crashed onto shore and after years of their wooden struts rotting away they have an almost ghostly appearance, their sad remains poking through the trees. The afternoon is free to explore Dawson; we may choose to take a boat trip up the Yukon River, discover the SS Keno, a restored vessel now a museum, or visit the Jack London Interpretive Centre. The writer of Call of the Wild and White Fang is one of the region's most famous residents, and set these iconic tales in the Yukon during the time of the Gold Rush itself. This museum is a labour of love by historians, who are obviously fans of his work. We can also discover Dredge Number 4, the best and most well restored old Gold Dredge, dating back to 1912 and now of great historical importance in the area. Today we have a full free day in Dawson to explore the city further, and to visit some of the museums and other spots that we didn't have time to see yesterday. There is also the option to hire bikes for half a day and explore the city's beautiful surroundings, or learn more about the region's goldmining history with a tour of a family-run working mine in the traditional goldfields of the Klondike. Today we head to Tombstone Territorial Park to explore the walking trails and wildlife found in this hiker's paradise. There are many different trails to explore, including the hike up to the Grizzly Lake viewpoint. The region encapsulates the spirit of the Yukon territory - virgin nature, solitude and the habitat of grizzly bears, in a setting of craggy, imposing mountains. After spending time in the nature, we head back to Dawson for the late afternoon. Here we can try another of Dawson City's traditions - the Sourtoe Cocktail. Established in 1973, this is exactly what it sounds like - an actual human toe that has been dehydrated and preserved, ready to gruesomely garnish a drink of your choice. On our final full day in the Yukon, we set off back to Whitehorse from Dawson this morning. The drive will take approximately 7 hours in the vehicle, but we aim to stop a couple of times en route, perhaps at the Tintina Trench Viewpoint or the Five Finger Rapids. When gold was discovered in the Klondike in 1896, the Yukon River was thought to be unnavigable above Five Finger Rapid - the rapids were a major obstacle along the route, and more than a few daring Stampeders ended up in the water after choosing the wrong channel, or 'finger'. We arrive in Whitehorse in the early evening. Our trip ends in Whitehorse this morning. May-Sep is the best time to visit, when the weather is usually warm, dry and pleasant. Temperatures can be a little cooler on the coast and in the mountains; rain can be expected at any time. Early in the season, there can be snow in some areas which may limit walking possibilities. There are a number of exciting optional excursions you can do on tour. These activities are booked and paid for direct with the supplier and do not form part of your Explore holiday contract. All optional excursion costs are subject to change at the discretion of the local supplier. A waterproof jacket and trousers, a pair of gloves and a hat are essential. Include some long-sleeved shirts and warm clothing. Thermal underwear is advised for chilly nights all through the summer months of June-August. Bring swimwear and a sun hat as well. Be aware that Alaska and the Yukon is home to many biting insects, particularly in the national parks, so you may wish to bring long trousers and long sleeved tops. Good quality waterproof walking boots, trainers and/or sandals for travelling. Luggage is stored either in the van or a trailer on the back. Please make sure the bag is of a reasonable size and preferably soft nature rather than a hard shell. You will also need a day pack for walking and personal items as your main luggage cannot be accessed during the day. Bring a water bottle, (head) torch for our stay in Haines Junction, some plastic bags, to keep things dry, sunblock, insect repellent and binoculars. An umbrella, and eye mask for sleeping may also be useful. In North America tipping 15%-20% is a recognised part of life across the service industry, including restaurants, activity suppliers, taxis and guides. Local staff will look to you for personal recognition of particular services provided. Unlike other Explore trips, during our trips in North America our Explore leaders will not operate a tips kitty. However, they will be more than happy to provide guidance throughout the trip on who to tip when and to suggest appropriate amounts. Beauty always comes at a price and the wonderful isolation of the Yukon and Alaska is reflected in the price of everyday items which normally have to be imported at great costs. The estimates given for Food and Drink are based on the average across Canada and the USA so when budgeting for your tour you should allow approximately double the amounts stated. Bring your money in Canadian Dollars or US Dollars cash which can be used almost everywhere, although local stores are not keen to change anything over $50. There are ATMs in the towns. ETA - Citizens of the UK, New Zealand, Australia and passport holders from several EU countries can apply for an ETA here - http://www.cic.gc.ca/english/visit/eta.asp - other nationalities should consult their local embassy or consular office. - https://i94.cbp.dhs.gov/I94/#/home - as each i94 accessed is only valid for border crossings for 7 days, it is best to apply for this when in country - your Explore Leader will assist you with this. Please note you must also ensure you get an entry stamp when going through immigration on arrival. In most cases the border agents will provide this stamp automatically but if for any reason they do not provide one, please ensure you request one as you will need this when crossing into the US. ESTA - Citizens of the UK, New Zealand, Australia and passport holders from several EU countries can apply for an ESTA here - https://esta.cbp.dhs.gov - you must have an electronic passport with a digital chip containing biometric information. If you have visited Libya, Iran, Iraq, Somalia, Sudan, Syria or Yemen since March 2011, or are a dual national of these countries, you cannot travel with an ESTA. In this case you will need to apply for a visa from the nearest US embassy or consulate. Please note for your ESTA application you will be required to supply Point of Contact information. This will be provided in your final documentation, which you will receive 3-4 weeks before departure. Explore's USA contact information will be listed as the first nights' hotel in the US. If you are leaving for the USA before this, please call the Explore team to get this information. Nothing compulsory, but we recommend protection against tetanus, typhoid, infectious hepatitis and polio. Please check the latest requirements with your travel clinic or doctor prior to departure. The above is not an exhaustive list. Further information regarding vaccinations and travel health advice can be found by following the NHS and NaTHNaC links at Explore Travel Health and from your local healthcare provider. Visa and vaccination requirements are subject to change and should be confirmed by you before travelling. Every thought about seeing the Northern Lights in autumn? Yellowknife, only 400km south of the Arctic Circle, is one of the best places in the world for spotting the Aurora Borealis. We run a four night departure in late-August and September, of which the dates may combine well with your Yukon trip. With three nights of Aurora hunting in cabins off the Great Slave Lake, there is an excellent chance of spotting the lights dancing across the sky on this trip. For more information and to check departure dates, click here. The Yukon is an unspoilt wilderness that Explore are privileged to visit. This remote land offers the same dramatic sceneries that the Canadian Rockies and Alaska have in spades - massive snow-covered mountains inhabited by wolves and bears, and emerald lakes flanked by pine forest - but the Yukon's absence of real tourism gives it a sense of isolation like no other. This trip couples outstanding natural beauty with fascinating goldrush history and includes a ride on the historic Whitepass and Yukon Route railway that cuts through the mountains linking the Yukon to Alaska. Please note that the Best Western Hotel in Whitehorse provides a free shuttle service to and from the airport.